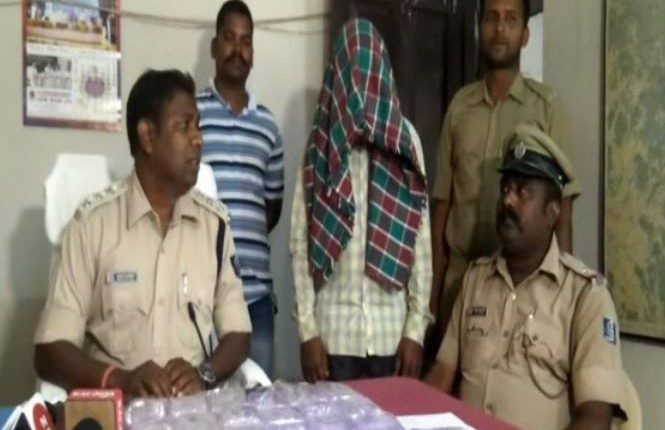 Phulbani: Solving a two week old loot case in which miscreants had decamped with silver ornaments weighing over 4 kg after breaking a bike dicky at Tini Chhak Bazaar under Daringbadi area, police today arrested the main accused. The held accused has been identified as Dasedu Kandul. Informing on the arrest at a press conference Daringbadi Police Station IIC Alekh Garadia said, around 4 kg silver ornaments were recovered from the held accused along with a Honda Glamour bike bearing registration number OD 32 B 6374, during a raid which was conducted in Aska area. “While two more persons have been involved in the loot, investigation is underway to catch them,” said the IIC. Notably, the victim silver jewellery trader namely P Prabhakar Patra of Aska area was returning home after selling ornaments to some customers in Daringbadi area on March 27 when the looters struck. Patra was having his launch by parking the bike in front of Hill View Hotel when Kandul and his two aides decamped with jewelleries by breaking its dicky. Later a case was lodged at Daringbadi Police Station in connection with the loot.